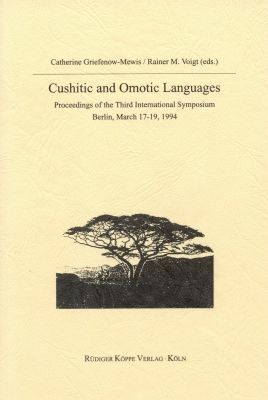 What makes the unity of Cushitic and Omotic studies and the unity of the relatively few scholars working in this field? It is, of course, the clear-cut genetic division of the languages spoken in East Africa. In general it is easy to identify a Cushitic, Omotic or Semitic language. But there is more to it than this. Northeast Africa is a specific area; it has an exceptional position within Africa. The landscape, the mild climate in the highlands, the dominance of the Ethiopic race (which is intermediate to the white and the black race without being a mixture of them), the strong Semitic impact since two and a half millenia, and the indigenous Christian culture have made East Africa a cultural province of its own that constitutes the third geographic-cultural larger area in Africa besides White Africa and Black Africa. All this contributes to the fascination of this area, and has had an influence on our commitment there. Was there ever a Southern Cushitic Language (Pre-) Ma’a?